Monroe Gallery of Photography, Santa Fe, NM, is pleased to announce "A Thousand Words: Masters of Photojournalism", an exhibition of more than 60 great photographs from the field of photojournalism. The exhibition opens with a public reception on July 3 from 5 - 7 pm, and will continue through September 27. The phrase "A picture is worth a thousand words" emerged in the early part of the 20th century, and is said to have been derived from a faulty translation of a Chinese proverb. However, the way a photograph can capture time, emotions, and feelings has made photography a unique art form. There are certain mysteries about great photographs that captivate viewers and cause us to pause in thought and remembrance. We have often seen these photographs reproduced numerous times in newspapers, magazines, books and documentaries. Universally relevant, they reflect the past, the present, and the changing times. These unforgettable images are embedded in our collective consciousness; they are defining moments chronicling our visual history. They are, indeed, worth a thousand words. Alfred Eisenstaedt once wrote, “The photographer's job is to find and catch the storytelling moment”. In today's ocean of bad news for the press--picture editors being laid off, agency, newspapers and magazines closures,--an island of hope, history, and artistic recognition is thriving in the photographs featured in the exhibition. Included are several photographs never before shown at Monroe Gallery, and photographs collectively exhibited together for the first time. The photographers in this exhibition have captured dramatic moments in time and illustrate the power of photography to inform, persuade, enlighten and enrich the viewer's life. These images also embody truth and beauty and represent what can genuinely be called "Masters of Photojournalism". View the on-line exhibition here. Monroe Gallery of Photography, 112 Don Gaspar Avenue, Santa Fe, NM, is pleased to join the membership of The Association of International Photography Art Dealers (AIPAD). With members in the United States, Australia, Canada, Europe and Japan, the Association has become a unifying force in the field of photography. AIPAD is dedicated to creating and maintaining high standards in the business of exhibiting, buying and selling photographs as art. Acting as the collective voice of the art photography dealers that make up its membership, AIPAD maintains ethical standards, promotes communication within the photographic community, encourages public appreciation of photography as art, concerns itself with the rights of photographers and collectors, and works to enhance the confidence of the public in responsible photography. AIPAD members provide a wide range of services to the public, such as exhibitions, appraisals, expert opinions and consultations. To qualify for membership in AIPAD, a gallery or dealer must meet a number of criteria. The applicant must demonstrate that a significant portion of his principal business has been and is devoted to the sale and promotion of fine art photographs which meet the Associations high artistic standards. The potential member must have a reputation in his community for honesty and integrity. The potential member must demonstrate that he has made and is making substantial contributions to the field of fine art photography through the quality of photographic art offered for sale, exhibitions mounted or catalogues published. Renowned photographer Stephen Wilkes was commissioned for a special photo-shoot assignment for the current issue of New York Magazine. The photograph accompanies an article on the new Highline area in New York City. For this panorama, Stephen Wilkes set up a rotating camera on a cherry picker at Tenth Avenue and shot throughout one day, from noon till 9 p.m.
Stephen Wilkes is one of the leading location photographers in the United States, recognized for his work in the corporate and advertising industries, for his fine art photography, and for his international documentary work. Perhaps Wilkes’ most ambitious project was photographing the south side of Ellis Island (1998 – 2003), other significant bodies of work include America in Detail; Bethlehem Steel; In Katrina's Wake; and China. Stephen Wilkes' photographs will be exhibited in a special 10-year retrospective at Monroe Gallery this fall. An iconic photograph of Albert Einstein was sold by a New Hampshire auction company Friday for $74,324, making it the most expensive Einstein photograph ever sold at auction, according to the auctioneers. The photograph was taken in 1951 while Einstein was celebrating his birthday at Princeton University. Photographer Arthur Sasse tried to convince Einstein to pose with a smile for the photo, but Einstein instead stuck out his tongue, producing one of the most recognizable images of the irreverent physicist. 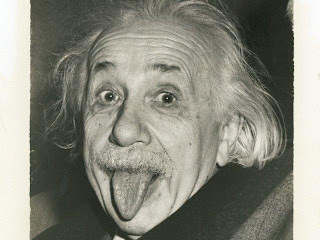 Although Einstein was amused by the photograph, his tongue gesture was more than joke, according to RRAuction.com marketing director Bobby Livingston. McCarthyism was reaching a high point in the United States, and scientists like Einstein were being asked to report on the activities of their colleagues. “This photo of Einstein is incredibly iconic, and for the first time Einstein explains why he stuck out his tongue,” said Livingston. “You can tell by his inscription that (Einstein) fully understood the power of the image, and that what he was doing was quite dangerous, considering that the government was forcing intellectuals to name names. The photograph was purchased by David Waxman, the owner of a New York store specializing in scientific books and autographs, Livingston said. Copyright 2009 by TheBostonChannel.com. All rights reserved. 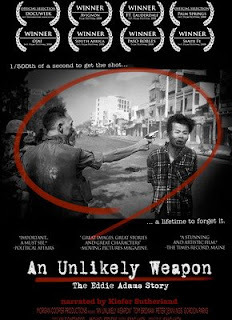 JULY SCREENINGS OF EDDIE ADAMS DOCUMENTARY "AN UNLIKELY WEAPON"
The documentary film on the legendary photojournalist Eddie Adams, "An Unlikely Weapon", will be screened in Denver and Los Angeles in July. A special concurrent exhibit of Eddie Adams' original photographs, curated and organized by Monroe Gallery, will be on view at the Denver Press Club . Los Angeles: July 10 - 12, Laemmle Theater, times and map here. Eddie Adams' most famous photograph -- of a Vietnamese police chief putting a bullet through the head of his Vietcong prisoner -- was perhaps the most iconic image of that contentious South Asian war. While some of the esteemed talking heads in Susan Morgan Cooper's "An Unlikely Weapon" maintain it changed history, it certainly changed Adams: The curmudgeonly subject of Cooper's affectionate docu is humble to the point of self-loathing, in what will surely be a draw for arthouse auds interested in photography, late 20th-century culture/history and the effects of accidental fame. Adams is made very much a presence in the film, so it's a constant surprise to have him referred to in the past tense by his colleagues and friends. (He died in 2004.) As Cooper's portrait eloquently displays, the late shutterbug was an artist; even his early combat photography had a compositional elegance. Adams had an eye for the big visual statement: His later work with celebrities included the over-the-shoulder shot of Clint Eastwood that became the poster for "Unforgiven." But the 1/500th of a second it took to take the picture that changed his life was out of his control: Adams was shooting reflexively when Gen. Ngoc Loan drew his revolver, and the fact that Adams caught the very moment the bullet was still traveling through the victim's head (Adams explains all this with something of a sigh) did not make the photo art. This clearly bugged Adams, as did the fact that he'd always been associated with an image of gruesome immediacy. There's more to Adams than one Vietnam War shot, and Cooper includes it all, from the photog's coverage of the Beatles' arrival in the U.S. (some of the archival footage seems to have been recorded in Britain) to his work shooting Penthouse Pets, and a lot of stops in between. From Muhammad Ali to Mother Teresa, from a black-veiled Jackie Kennedy to a worn-out Louis Armstrong, few major figures of Adams' times seem to have eluded his lens. Interviewees in the film range from broadcasters Tom Brokaw and the late Peter Jennings to photographers Bill Eppridge and Nick Ut, who took their own iconic '60s photos -- Eppridge's famous shot is of the just-assassinated Robert F. Kennedy; Ut's was of then-9-year-old Phan Thi Kim Phuc running naked from a napalm attack on her Vietnamese village (Phuc is also in the film). It's their reminiscences that are the most poignant and revealing about a man who seems, in Cooper's interviews, to have done all he could to conceal himself. Production values are excellent, the editing intelligent and the music by Kyle Eastwood and Michael Stevens unobtrusive but moving. Michigan Central Station: Eyesore Or Landmark? In April, the Detroit City Council voted to have its historic Michigan Central Station demolished. The decision has been met with mixed emotions: Some Detroiters feel attached to the building, viewing it as an integral element of the city skyline. Others see its sad decrepitude as a reminder of the city's decay. Listen to NPR's story here. The slide show is here, and more of Smith's work may be viewed here. Whether an eyesore or a reminder of the good old days, most can agree on one thing: The train depot is visually striking. Photographers and explorers have been sneaking into the fenced-off station for some time, traversing its cavernous innards -- a vestige of what was once a bustling hub of hellos and goodbyes. Graffiti, rubble and shattered glass have overgrown the building's neoclassical foundation, and yet citizens are still ambivalent about its destruction. The city has postponed the demolition but has not gone so far as to set a date for reconsidering the verdict. 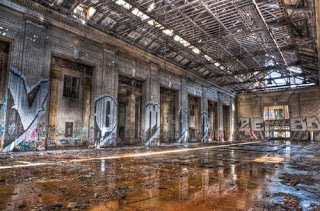 When I heard people were getting into the abandoned shell of Michigan Central Station in Detroit, I was curious, remembering childhood train trips to Chicago. I knew that the digital techniques I have been working with (which include high dynamic range imaging) could dramatically transform this tragic and forgotten building into a "Hyper Real" reminder of its past glory. Michigan Central Station was Detroit's passenger rail depot from its opening in 1913 until the last Amtrak train pulled away on Jan. 6, 1988. Now abandoned, the building is of the Beaux-Arts classical style of architecture, designed by the Warren & Wetmore and Reed & Stern firms, who also designed New York City's Grand Central Terminal. The main waiting room was modeled after an ancient Roman bathhouse with walls of marble. This portfolio is one of a series of portfolios from an architectural project on the city of Detroit. The project seeks to use architecture as a metaphor to illustrate the transformation of Detroit in the 21st century. Smith's series is currently on display at the Museum of Contemporary Photography at Columbia College in Chicago, part of a group exhibition called The Edge of Intent. Monroe Gallery of Photography is honored to announce it is now representing John Filo and his Pulitzer-Prize winning photograph of the National Guard shooting at Kent State. 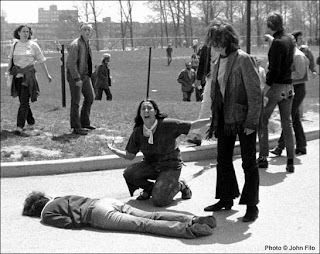 This past May 4 was the 39th anniversary of the G company of the Ohio National Guard firing on student protesters. May 4, 1970 has become a day forever etched into American history. On that day, four Kent State University students were killed and nine students were wounded by National Guardsmen who were called onto the campus in response to protests and demonstrations against the Vietnam War. John Filo was a senior at Kent State working in the student photography lab when the shots rang out just after noon on that day. During the confrontation and ensuing chaos, he photographed a then 14-year-old runaway named Mary Vecchio as she kneeled over the bleeding body of Jeffrey Miller. Filo received the Pulitzer for his photograph while still a student at Kent State. Filo joined the Associated Press in Chicago in 1971 where he worked as a photographer for 10 years. He has also worked at the Philadelphia Inquirer, the Baltimore Evening Sun, Sports Illustrated, and has served as the National Picture Editor for Newsweek. For the past five years, Filo has held the position of manager of photo operations for CBS. This photograph will be featured in the important exhibition: "A Thousand Words: Masters of Photojournalism" at Monroe Gallery, Santa Fe, July 3 - September 27.